Shire Barclay Corner Summer House: The Shire Barclay Corner Summer House is available in three sizes, 7 x 7, x 8 x 8 and 10 x 10, this summer house features a set of double doors which can be opened right out on a summers day and also 2 full length fixed windows allowing maximum light to enter the building. 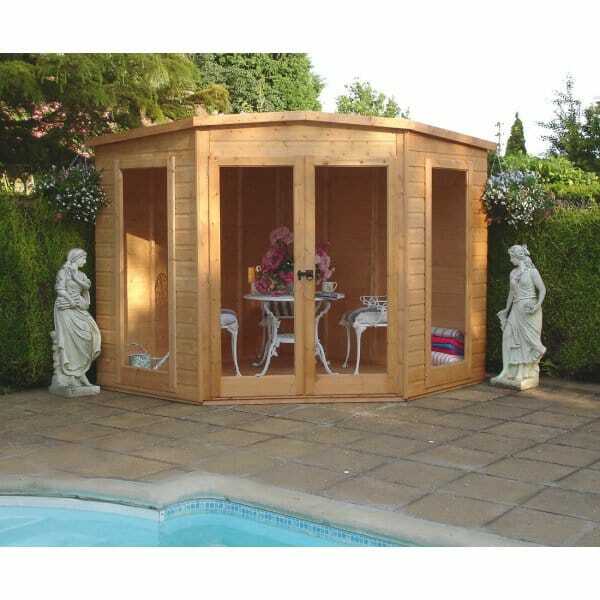 This summer house would fit neatly into the unused corner space in the garden and has a low ridge height of below 2.5m and would be perfect to use for relaxation on a warm evening. All the timber used timber is from sustainable sources. Review - Excellent value and already we have enjoyed much time in our t. Ideal for lazy afternoon reading, tea etc. Definitely recommended. Excellent value and already we have enjoyed much time in our t. Ideal for lazy afternoon reading, tea etc. Definitely recommended.